Last week, Yahoo’s Tim Brown approached Giancarlo Stanton with a question: Had the Marlins’ relatively positive showing this season altered the slugger’s view of the organization? Those may have just been words, but they were telling, and they did plenty to fuel the fire of intrigue surrounding Stanton’s future in Miami. Will the Marlins extend their young star? Trade him this offseason? Stand pat and enjoy his final two years under team control before he becomes a free agent after the 2016 season? While reports indicate they’ll likely ride out Stanton’s contract even if they fail to lock him up long-term, the rest of the baseball world won’t be content to sit back and watch for two more seasons. Stanton is enjoying a monster 2014 campaign, hitting .293/.401/.561 while bashing 35 home runs, bringing his career total to 152. He’s just 24, barely a year older than NL Rookie of the Year front-runner Billy Hamilton, yet he’s already playing in his fifth major league season, and he could be on his way to his first NL MVP award. If the Fish try to sign Stanton to an extension, the price tag could be enormous. If they ultimately bite the bullet and put him on the trade market, however, things could get even crazier. Teams bidding for Stanton would be vying for a player with an exceedingly rare combination of skill and youth. In fact, it’s been nearly a century since a team has traded a hitter this good and this young. And that hitter was Babe Ruth. Early on, Stanton went by Mike. When he was drafted out of Notre Dame High School in Sherman Oaks, California, in the second round in 2007, the hulking outfielder and first baseman was five inches taller, 50 pounds heavier, and 22 years younger than the well-traveled three-time World Series champion who shared his name. The younger Stanton had the athletic ability to match his size, earning an offer to walk on at USC to play receiver and defensive back for Pete Carroll. Stanton ditched football to sign with the Marlins, and got a 17-game minor league cup of coffee that year, hitting .161 with one homer in 63 plate appearances across two levels. Those small-sample struggles did nothing to spook talent evaluators, and Baseball America promptly named Stanton the best power hitter in the Marlins’ system while declaring him the organization’s ninth-best overall prospect. BA scribe Mike Berardino praised Stanton’s huge raw power, but also his arm strength and the impressive speed he boasted for a player of his size. Stanton’s 2008 season cemented that scouting report. Playing in the South Atlantic League, Stanton whiffed an incredible 153 times in 125 games. He was only 18, though, and playing his first full professional season, so some rough edges were excusable. Plus, his game was improving rapidly. He worked with Greensboro pitching coach John Duffy that year to harness his natural arm strength into quicker, more accurate throws. His fly ball catching improved as the season advanced. And he hit the ball pretty well when he made contact, blasting an incredible 39 home runs in 468 at-bats. As his career progressed, Stanton improved his all-around game, while continuing to hit baseballs to the moon. He cranked 28 homers in 2009, an incredible feat for a 19-year-old playing at high Class A and Double-A. By 2010, the Marlins couldn’t hold him back any longer: After he batted .313/.442/.729 and swatting a preposterous 21 homers in 192 at-bats at Double-A Jacksonville, the Fish called him up in June, continuing their tradition of quickly promoting precocious prospects, such as Miguel Cabrera, who debuted at 20. Stanton flourished immediately. Installed as the everyday right fielder, he thumped 22 homers in 359 at-bats, slugging .507 for the year. Better yet, he was no longer a one-dimensional player: According to Baseball Info Solutions, Stanton saved 13 more runs than the average right fielder in 2010, using his long strides and improved instincts to cut down would-be singles, doubles, and triples. Stanton’s numbers improved with each passing season. He hit .262/.356/.537 with 34 homers in 2011, his age-21 season. The next year, when he started going by Giancarlo, he batted .290/.361/.608, clubbing 37 bombs, leading the league in slugging (.608), and making his first All-Star team. He also improved in subtler ways, hiking his line-drive rate from 17.7 percent in 2011 to 19.9 in 2012. Though still primarily a powerful pull hitter, he started going with the pitch more, whacking 19.9 percent of his hits to the opposite field, versus 17.4 in 2011. Perhaps most impressive, pitchers started running out of safe places to pitch him, as Stanton’s hot zones expanded to included much more of the plate, and even some areas off the plate. But even amid that blistering hitting in 2012, things weren’t perfect. Stanton played just 123 games that year due to injuries, including an oblique strain and soreness in both knees that eventually led to right-knee surgery. The injury bug hit again in 2013, most notably with the recurrence of hamstring problems that had bothered him two years prior. The only thing as impressive as Stanton’s majestic home runs was his imposing stature, but old baseball biases die hard, and as the injuries mounted, many wondered if his bigger, taller, and stronger frame portended additional impairments down the road. If he was missing 39 and 46 games at ages 22 and 23, respectively, what would happen as he aged? In 2013, when injuries combined with a drop in line-drive rate, Stanton saw his batting average (.249) and slugging average (.480) fall to career MLB lows. That’s when the trade rumors began in earnest. Marlins owner Jeffrey Loria had earned a reputation for trading away high-priced stars and even the players who were just starting to get a little pricey, from the Cabrera/Dontrelle Willis trade that failed spectacularly to the post-2012 fire sale that chased Mark Buehrle, Jose Reyes, and Josh Johnson out of town. Unlike so many other teams that were starting to lock up their young players earlier and earlier, the Marlins failed to act with Stanton. He hit arbitration in the winter of 2013-14, earning a handsome $6.5 million reward three years before free agency, on a team still seemingly years from contention. Trade rumors swirled, but a deal never materialized, and Stanton returned to Miami for the 2014 season. He’s been an absolute terror ever since. With his second homer in two games on Tuesday,1 Stanton thrust himself into some impressive company: Though we rarely mention runs batted in ’round these parts, we have to note that on Tuesday, Stanton became just the second Marlin ever with 35 homers and 100 RBIs in a season, joining mega-masher Gary Sheffield. Stanton is on pace to set career highs in batting average, OBP, slugging, and park-adjusted offense. He’s already topped his career highs in walks, total bases, and Wins Above Replacement. Ignoring the silly premise that players should be judged during awards season based on the quality of their teammates, Stanton might be the best position player in the NL this year, ranking second in park-adjusted offense and, depending on the source, either first or second among NL hitters in WAR. 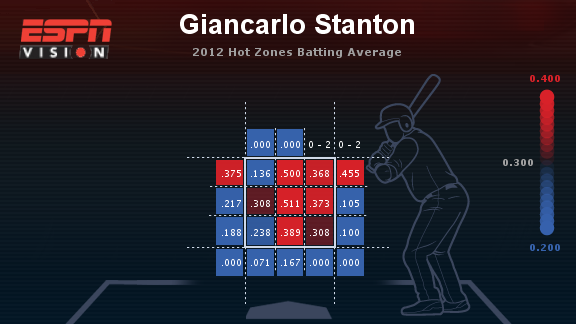 There are a couple reasons for Stanton’s assault on pitching this year, beyond his usual power-hitting excellence. First, while he remains strikeout-prone — thanks to staying healthy and playing every day, he’s on pace to fan a career-high 189 times — the rate at which he’s striking out has actually edged lower over the course of his career. 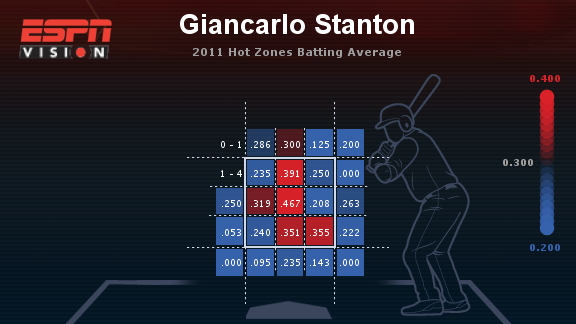 Second, Stanton is absolutely annihilating pitches up in the zone this season. 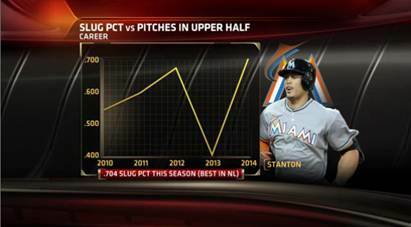 He’s slugging .705 on those pitches in 2014, second only to Jose Abreu among qualified hitters. He’s also cut his strikeout rate and swing-and-miss percentage against those pitches. As amazing as Stanton has been this year, the sum of his career accomplishments coupled with his 2014 improvement is what should really make us wonder if we’re watching an all-time great. He’s only the 11th player to mash more than 150 career home runs through his age-24 season. Here’s the full list; unsurprisingly, most of these players are either already Hall of Famers or on their way. That combination of power and all-around contributions (including his defense, which remains solidly above average, per DRS) has generated tons of value for the Marlins already. It also raises the question of how much Miami might have to pay Stanton to retain his services long-term. With just two full years of team control remaining, Stanton stands to make more than AL superstar Mike Trout did when Trout inked his six-year, $144.5 million extension, since potential years on the open market command much bigger salaries. If Stanton were to sign a six-year extension tomorrow, a price tag approaching $175 million might be reasonable. Moreover, that kind of deal would make him eligible for another massive payday at age 30, at which point the salary figures could become truly astronomical. Now here’s the kicker: Amid the possibility that the Marlins might try to trade Stanton, we scoured the history books to think of a player with this combination of youth, skill, and success who was traded at the same point in his career. The best comp we could come up with was a player who had also amassed just more than 20 Wins Above Replacement through his age-24 season. Of course, that WAR figure underestimates the player’s value at that time, since he was also one of the greatest pitchers of his era. That’s right. If the Marlins trade Stanton, the closest comp will be the Red Sox selling Ruth to the Yankees in 1919. It’s open for debate what Stanton would actually fetch on the open market, though Victor Wang’s research on the value of prospects can give us some sense. The truth is, though, there might not be a simple formula to explain the bounty the Marlins could get in return. Stanton is hitting home runs at a historic rate. He’s still three to five years younger than most hitters are when they peak. Plus, the leaguewide drop in offense and dearth of power hitters could drive the price for Stanton’s services sky-high. If a pursuing team believes it can lock up Stanton this offseason for well beyond the two years remaining until his free agency, we could see one of the most jaw-dropping trades in baseball history. So enjoy what’s left of this spectacular season. Because a few weeks from now, the real craziness might finally begin. ESPN Stats & Info’s Michael Bonzagni provided research assistance for this article. He’s also hit three shots to the warning track in his last three games.